With Atomic Reach, simply connect your Google AdWords account and start polishing your ad copy with our suite of editing tools. Create new ads based on a current existing ad in Atomic Ads. Step 1: Clone an ad from the campaign you are working on. 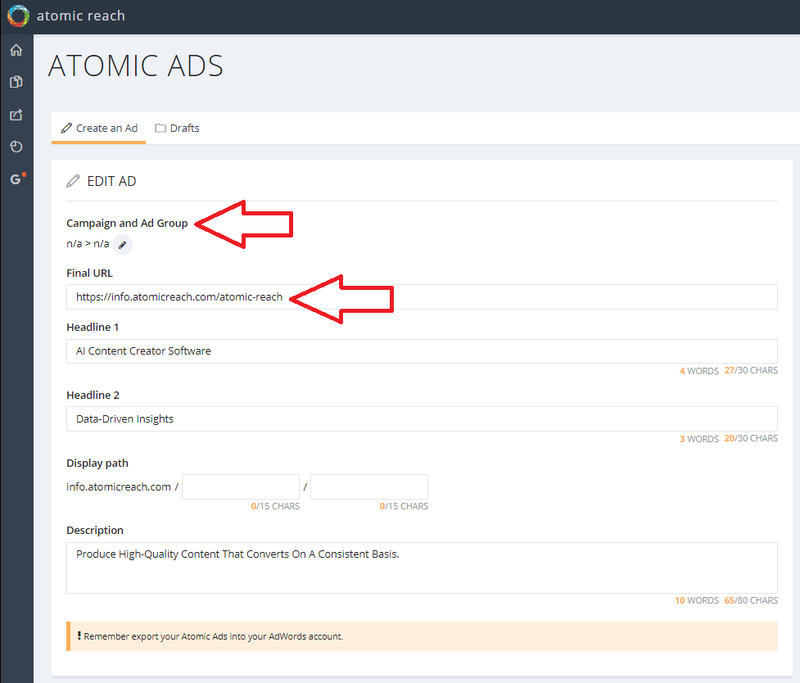 You can see your campaigns/ads from the Analysis tab of the Atomic Ads module. Select the yellow button at the far right to clone and optimize the ad. Step 2: Before you start re-writing, make sure the correct ad group, and final URL are entered. Tip: the first step towards having a great ad is to have a great landing page. Optimize your landing page copy with our Atomic Content module. Step 3: To start creating new versions of your ad, click on any word in the ad copy to receive feedback and alternative words that can be used (similar to the writing environment for Article/Blog posts). Step 4. Once you are satisfied with your copy, you can either save it as a draft or export as a CSV to upload into Google Ads. Alternatively, you can click the Generated Ads tab (currently in beta) that are based on your ad copy and its final URL. If you see an auto-generated ad that you like, you can either press the + symbol to begin editing or press save to save a copy of it to your drafts. Once you are satisfied with your ad copy, you can copy them over to Google Ads or save the draft to move onto the next ad. Consider including topics that perform well from your blog into your ad copy and ad group. People who are interested in your products are searching for these terms and they found your articles to be the most relevant. This gives you great credibility. Consider phrasing your offer as a benefit that your potential customers can enjoy, ads phrased like this generally perform better. Try to always incorporate a call-to-action in either your headline or description. Better yet, make it time sensitive so that you can drive conversions via their fear of missing out.